Educated at Haileybury College and Reading University, before war service from 1939-45, Peter Sylvester-Bradley taught for two years at the Seale Hayne Agricultural College. After the War he was successively an Assistant Lecturer and Lecturer in Geology at the University of Sheffield from 1946-59 before his appointment as F.W. 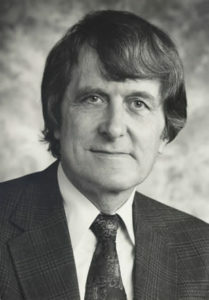 Bennett Professor of Geology at the University of Leicester in 1978. One of the leading international authorities of his generation on palaeontology, particularly ostracods and oysters, Jurassic stratigraphy, evolution and the origin of life, he held the Leicester Geology Chair to his death in 1976.